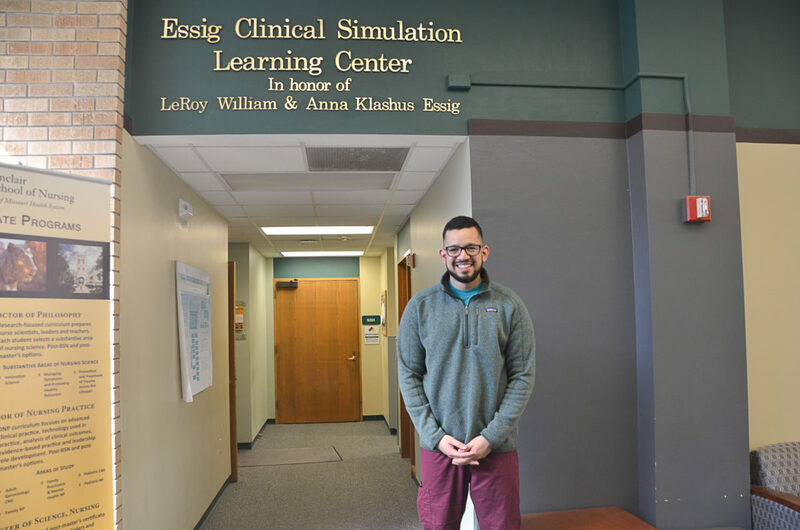 On two separate occasions, accelerated student Robbie Towner has been able to assist victims of intimate partner violence (IPV) because of simulation training he received in the MUSSON Simulation Center. Originally from California, Towner works as an EMT at Women’s and Children’s Hospital in Columbia while completing nursing school. During his mental health class in the Sinclair School of Nursing, Towner and his classmates completed an IPV simulation event, which taught them how to recognize signs of IPV and assist the victim while keeping everyone safe. Once while on a shift, Towner was assisting a victim whose husband had gone to the hospital with her. When her husband wasn’t looking, the victim mouthed “call the police” to Towner. Because of his training in the Simulation Center, he knew the proper steps to take to separate the woman from her husband safely and get police intervention. Another time, a woman came into the emergency room at 3 a.m. with non-specific symptoms. Suddenly, she made a comment that took Towner aback. “I don’t have any family here, so I won’t be having any visitors,” she said. Some may have brushed that comment off, but because of his training in the Simulation Center, Towner knew this could be a sign the woman was fleeing intimate partner violence. He mentioned his concern to the doctor, who explored further and confirmed Towner’s feelings were correct.